Towards the beginning of the year, there was a big push to encourage our elected officials to vote in favor of supporting the Special Diabetes Program, which is used to help fund research, treatment, and education. I wrote a post on this blog – an unpopular one, it seems – where I questioned whether the United States government, already up to our eyeballs in debt, should be giving money to “special interests” such as SDP. Eventually, I did fill out the online form to send a letter to my Congressmen, though I had reservations at the time. (The SDP passed, by the way). Well, I’ve had a change of heart. I think what did it for me was when I attended my local JDRF chapter’s annual meeting/dinner about a month ago. Whether it’s what they taught me or if it’s just a new perspective, I’m not sure, but I’m now fully on-board with the SDP. I learned that the SDP contributes roughly half the funding needed for the research, treatment, and education, while the other half comes from fundraising and donations. This proves that the diabetes community isn’t standing in line in Washington with empty pockets and an extended palm, but that we are seriously dedicated, and are also seeking funding — successfully — from the community. Not only that, but the recent developments in diabetes research — increasingly reliable CGMs, dual-chambered pumps, glucose-responsive insulin, legislation protecting our kids at school, cure research — all of it — proves that the funding works. It’s not just feeding someone’s dreams of what may or may not happen, but it is really making a difference. It’s yielding results. The SDP an investment in the future. It’s making people with diabetes (PWDs) healthier. It’s making families happier. It’s reducing the frequency of dangerous and costly medical emergencies. Someday, it may even turn PWDs into PWODs. Oh, how I would love to be a PWOD. So, when I got the email from JDRF on Tuesday asking me to write to the politicians who represent me, encouraging them to support the SDP, this time I didn’t hesitate. I did it. And in the little box where they asked me to write my own personal paragraph, I wrote three. I could have written many more. There’s another reason I felt it important to send this letter. Last year, I knew that my state’s two Senators would endorse the program. I didn’t know where my House Representative stood, though from the response I got, I wasn’t convinced he was in favor of the program. I was a bit saddened by the email telling me he would consider my views while casting his vote. But this year, one of the names was unfamiliar to me. For as long as I can remember, Senator Frank Lautenberg was a vocal supporter of the little guy. He spoke for the guy who didn’t have what his neighbor had – whether it was reliable transportation to work, clean air to breathe, or a properly functioning pancreas. I won’t debate politics here (and they did inspire debate), but he made no secret of what he believed in. Well, Senator Lautenberg passed away early last month, and Governor Christie hand-picked someone to fill-in for him until the general public elected a replacement in October (more controversy, but again – this is not the place for that). I have no idea where Jeff Chiesa stands on this issue. I don’t even know if he’ll still be in office when it comes time to vote on the SDP. (I’m also confused as to why this issue is coming up for vote already, but I was never particularly fluent in politics). I do know that he probably isn’t as familiar with the will of the people as a five-term senator. If the SDP vote were to not pass, I would feel defeated. In a time when progress in dealing with diabetes seems to have a ton of momentum, it would be hard to see it all come to a screeching halt. You are free to make up your own mind when it comes to the SDP and government funding, and I won’t tell you what you should do. I’ll just tell you how I feel. But if you feel the same way as me, I will tell you how simple it is to fill out a simple form that will automatically email your two Senators and one Representatives. And I’ll show you the link to go to and do it. 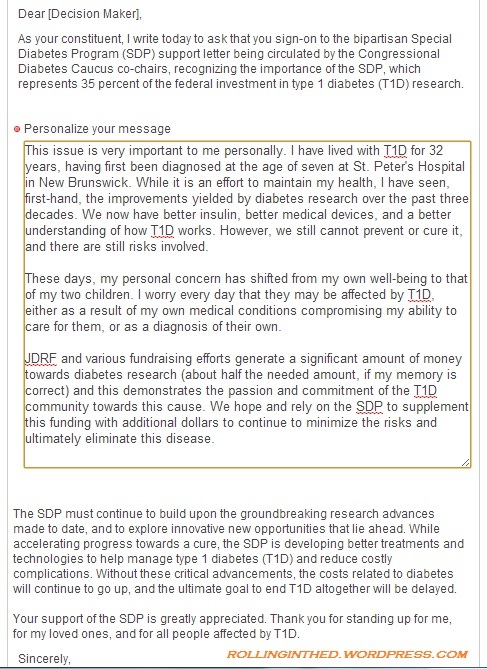 Posted on July 18, 2013, in Diabetes, Support and tagged SDP. Bookmark the permalink. 5 Comments. Thanks for sharing your change in perspective on this, Scott. Yes, you’re right – it’s made a lot of difference to date, and I’d venture to say that “our present that used to be the future” wouldn’t be what it is today without the SPD dating back to the late 90s. I wish Congress would do what they’ve been asked to do for a very long time – renew it for a multi-year stretch, rather than having to vote on this again every year or so. Anyhow, thanks for the insightful post and for speaking up to decision-makers. Why is the SDP which is funded at $150M a year a “special interest” as compared to HIV/AIDs which is funded with $29.7B? Yes, that is a “B.” This is not about special interest, this is about allocating federal investment to address the needs of our society in a balanced manner. Brian, I agree with you. By putting the term in quotes, I was hoping to get the point across that the term wasn’t quite accurate. In my earlier post in January, I used the words without quotes – believing that this truly did apply as a special interest and only catered to a small subset of the population who cared. While writing this one, I felt that the use of punctuation would acknowledge my thoughts at the time without actually supporting them. (I’m not particularly proud of that post, which is why I’m not linking back to it). As I wrote here, my thoughts on the whole SDP topic have evolved, and I do see the benefit that SDP has to society as a whole. Perhaps my writing skills still have a bit more evolving to go. Thank you for pointing out the confusion that could arise from the words I chose, and for the chance to try to clarify that. I hope this addresses your concern. Thanks, Scott. I wrote my letter, too. Funny, but I didn’t appreciate all of the government advocacy stuff until I experienced something from JDRF, too. It was participating in Government Day back in 2010 or so.